Are you looking for a new pair of prescription eyeglasses? How about a pair of really cheap eyeglasses? If so, I highly recommend checking GlobalEyeglasses.com! They have hundreds of discount glasses that are sure to fit within your budget. In fact, prices start at just $6.95!! Check out the pair of glasses pictured above...they look exactly like the ones I'm wearing right now. 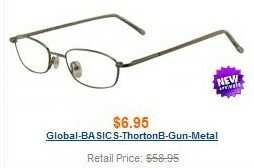 The only difference is, I paid almost 10 times more than I would've paid at Global Eyeglasses! You'll find glasses for the whole family, including children. You'll also find cheap prescription sunglasses from designer brands like Versace and Dior at awesome prices! You can get ALL that for as low as $6.95! You'll also find a neat "Try Before You Buy" feature on the site where you upload a photo of yourself and can actually "try on" as many frames as you want to get an idea of what you'll look like with them on. That is the only reason why I haven't bought a pair of online eyeglasses yet. I would hate to buy a pair only to find out I look ridiculous in them! Another great thing about the site is there are tons of search functions. If you already know what color, price, frame shape, size or style you want, you can whittle down your search results to find exactly what you're looking for! Every Global Eyeglasses purchase also comes with a 90-day, 100% satisfaction guarantee. If for any reason you're not satisfied with your purchase, they'll give you a full refund! You can save even more money on your eyeglasses needs by using the code wishfulthinking247 at checkout to save 15% off your order! Click here to visit Global Eyeglasses! I have been wearing glasses ever since I was in the Second Grade in school. And glasses are my favorite accessory hands down, too. Recently, i found a really online glasses website - GlassesShop.com. Big discount and huge styles.